Mini roundabouts are almost certain to be a part of a driving test if they are located within the driving test centre test routes radius. Mini roundabouts are often put in place of T-junctions in quieter residential areas. A mini roundabout offers two purposes; a junction between two or more intersections and an effective form of traffic calming. Due to the small size of mini roundabouts, they can often be confusing as to who has priority, especially for the inexperienced driver. This tutorial will provide the correct procedure for driving on mini roundabouts along with the correct rules for drivers, plus those learning to drive. Although the general procedure for using mini roundabouts is similar to their larger versions, due to their small size and placement, often found in narrower residential areas, a great deal of observation and care needs to be taken whilst dealing with mini roundabouts. Mini roundabouts can be difficult to see due to their size. A blue mini roundabout sign isn’t always located before the roundabout, so during a driving test, keep a keen eye on road markings and road signs. Whilst driving, look for road signs, traffic crossing in front of you, junctions to the left and right or road markings that may help you identify a mini roundabout. Mini roundabout road markings are either a painted circle or a white circular hump with 3 clockwise directional arrows around the inner circle. Due to the locations of mini roundabouts, they have a greater chance of being located at closed junctions. A closed or blind junction is where very little can be seen of approaching traffic. 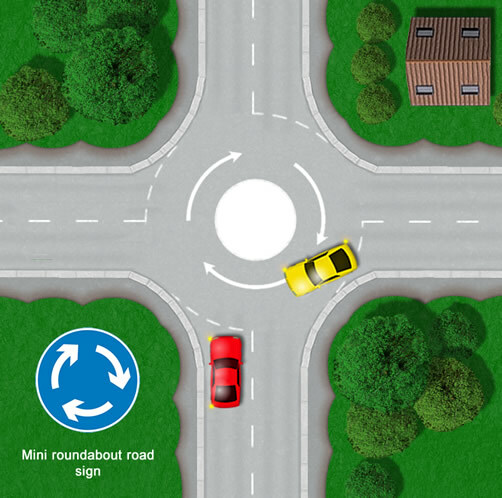 Mini roundabouts are used frequently during a driving test for your ability to correctly establish is a junction (or roundabout) is open or closed and to act accordingly. A closed roundabout must be approached very slowly and if in doubt, stop before proceeding. Edge forward using clutch control slowly, constantly checking all exits and entrances. As with all roundabouts in the UK, drivers approaching a mini roundabout must give way to traffic approaching from the right. As with normal roundabouts, if turning left or right at a mini roundabouts, an indication must be applied. As mini roundabouts are small however, a secondary exit signal does not have to be implemented. On normal roundabouts, vehicles frequently do not indicate, on mini roundabouts however, vehicles usually indicate, especially if they intend on turning right. If a vehicle is turning right at a mini roundabout, due to its small size, it is far too dangerous not to indicate. During a driving test, the examiner will expect these rules to be followed. Initially look into the interior mirror, followed by the left mirror and indicate to the left. As it is likely to be a residential area, just before turning left. check the left mirror again for cyclists. Mini roundabouts are junctions and therefore potential hazards. The examiner will expect you to be checking your interior mirror on approach to a mini roundabout. Unlike large roundabouts, there is no need to indicate left after the first exit. Check the interior mirror, followed by the right wing mirror and indicate to the right. There is no need to indicate to the left just after the 2nd exit as you would on normal roundabouts. The white centre circle of a mini roundabout can be either simply painted onto the road or it may actually be a circular hump in the road. Whilst navigating a mini roundabout during a driving test, try to avoid driving on the centre circle. Although clipping the circle slightly with the wheels is unlikely to fail a test, blatantly driving over the circle is likely to result in a failure. Try also to avoid driving over any hatch marking lines on or close to the roundabout. These markings are put in place as a safety feature to separate vehicles. Hatchings surrounded by a solid white line must not be crossed, hatchings surrounded by a broken line can be crossed but it is advised not to. Avoid if at all possible to make U-turns on mini roundabouts. As they are so small, this manoeuvre is highly dangerous. Locate a safe and quiet road to make a turn in the road or reverse round a corner. Be cautious, especially as an inexperienced driver, that other vehicles may make U-turns at mini roundabouts. As mini roundabouts are so small, it is essential that if you intend on turning right, as you approach a mini roundabout you must indicate to the right. Failure to do so is likely to result in an accident with a vehicle approaching from the opposite direction. Lack of indicating and unnecessarily stopping at a mini roundabout when vehicles behind you aren’t expecting you to stop are the most frequent cause of mini roundabout accidents. Unnecessarily stopping at mini roundabouts is an easy way to fail a driving test. The reason, a vehicle behind you will not be expecting you to stop and so could result in a rear collision accident. If the roundabout is closed or you need to give way to a vehicle or cyclist from the right, this is usually the only reason you should need to stop. Obviously mini roundabouts are small and for a learner driver to see a car approaching the roundabout from the left, can be tempting to stop, especially if the vehicle appears to be traveling at speed. Unless the vehicle is relatively close to the roundabout, is traveling at excessive speed and you feel that they will not be able to stop, don’t be tempted to stop and give way to them. Remember, this is dangerous for vehicles behind and will fail the driving test. Although it is legal to overtake a cyclist on a mini roundabout, during a driving test it may be more appropriate to slow down behind the cyclist and wait till they have cleared the mini roundabout before overtaking. This is for two reasons; cyclists can be unpredictable and change direction on or close to the roundabout or there may not be adequate room to overtake the cyclist without driving over the central circle. Very clear and straight forward. Nicely split up into different sections, and no waffle. What about the situation where you are turning left at the roundabout and at the give way line but a car is fast approaching from the right, doesn’t look like it wants to, or can, stop but is some 10 metres from the give way line? I know it’s common sense for you to stop in case the driver on the right, assumes right of way but as you’re at the island first you should have the right of way. A lot of driving tests are failed at mini roundabouts due to the confined nature of them. Many learners fails for giving way when they should push on. That said, the fundamental rule is to give way to the right regardless of who reaches the junction line first, so it’s often careful, but quick judgement and decisions needed as every situation is different. Can someone please clarify for me!! On a normal 4 way mini roundabout if two cars are approaching each other with no cars approaching from the right and one of the cars wants to turn right who gives way?? is it the car that is turning? or the car going straight ahead? It’s the same as a normal roundabout – so, in your description, there is in fact a car approaching from the right, it’s the car that wants to turn right. So it will be the car going straight that must give way. So regardless of which car that is turning, the car that is turning has right of way.. thankyou for that. The problem I have with mini-roundabouts is some drivers turning right cut across the centre (or even to the right of!) the circle on the road. I tend now to be careful to go round the circle as much as I can, but it does confuse some people. Mini roundabouts certainly are one of the more risky junctions simply because you’re driving at very close quarters to other road users and are very dependent on their ability to drive safely. The situation that you explain can be hazardous, but it’s also worth remembering that larger vehicles often find it necessary to cut across the centre circle and therefore often require extra room from other vehicles. Mini roundabouts do not work! I do a lot of town driving every day, and the amount of times myself and 2 other cars have arrived at a mini roundabout at the same time, and everyone just sits and looks at each other, until someone has the guts pull off (praying that the other two have decided to stay put to avoid crashing) it’s like playing Russian roulette! For me the idea of a roundabout is that traffic flows around it, and this is most certainly not the case with a mini roundabout. Agreed, there certainly are more hazards associated with mini roundabouts when compared to normal roundabouts. Drivers who don’t bother indicating can be a problem, particularly if they’re turning right and crossing your path – annoying on normal roundabouts but dangerous on mini roundabouts. Drivers using mini roundabouts to make a u-turn can also be unexpected. I totally agree Mark, especially if I am turning left I have experienced some drivers who are turning right on a three way mini roundabout have cut over the middle and almost caused a collision. I would say that it’s common sense to drive according to the conditions, in other words if any individual situation doesn’t look safe as the one you just mentioned where you even think you have the right of way, don’t risk it, it only needs to happen once. I would say let it pass and live to drive another day. As with a lot of things today, standards have dropped in road manners as with everything els. Hi….could you clarify at a mini roundabout with only three exits. Firstly if your turning left and cars coming across in front of you wanting to go tha same direction who has priority ? For the first mini roundabout in your example, if you’re turning left and there are cars coming from straight ahead wanting to turn right, those cars would have priority over you. If you think of this situation as a larger roundabout, these vehicles would be approaching from your right, so you would need to give way. The exact same situation would apply to your second example, they would be approaching from your right, therefore you would need to give way. Try and think of it as a bigger roundabout and it makes sense. Mini roundabouts can be confusing, especially when they’re busy. Regardless of priority, it’s often best to be very cautious at busy mini roundabouts, particularly due to drivers who forget (or just don’t bother) to indicate. Am I right it thinking if you come to a mini round about that Is quite big and on a main road, as long as I can see all exits and cars on them (and obv my right is clear) I simply have a quick glance at all exits and proceed when safe (simply just slowing down, not stopping at all). Yes that’s correct. Roundabouts are of course junctions and with any junction, you get open (clear to see any traffic approaching) and closed (potential traffic is obscured by trees, fences etc). It’s all about using the appropriate speed when you approach a roundabout as this will enable you to properly observe and safely make a decision on whether you need to stop or continue. Remember that stopping at a roundabout that is open and clearly safe to proceed can also be dangerous (rear vehicles), so it’s all about your ability to judge each situation correctly. What if a vehicle from the opposite direction does a u/turn at a mini roundabout ,which can be dangerous. Making a u-turn at a mini roundabout is dangerous and I never understand why some drivers choose to do this rather than carry on a little further to find a safer method.